There have been a lot of movies in the history of, well, movies. Some legendary, some clunkers. But the fine folks at the American Film Institute, or AFI for those who only know it by that name, have watched every single movie ever and compiled a list of the 100 greatest. And that is the source of the new comedy The List (The Greatest, Most Absurd 100 American Movies Mash-Up Parody Ever Stitched Together). Written by Bryan T. Donovan, The List takes the AFI 100 Top 100 and slams them all together. The play is set up as one of the list makers questioning the list thus forcing him to watch them all thus forcing him to go insane and literally see all the movies as one. The man takes the role of Oscar Schindler and goes on a journey through cinema history. On the journey we meet some epic mash-ups, through plot and character, which keep the play churning. The majority of the audience will probably have not seen the entire list, but writer Donovan doesn’t care. To tackle all 100 takes some skill, he pulled from some more obscure moments, but where The List shines is through the obvious. Letting an audience in on the joke is a surefire way for a laugh. So when you attempt to pull a laugh from something the audience may not get, chances are it’s not actually funny. But using the obvious quotes and characters, that’s when the funny came out. Unfortunately, that wasn’t very often. It’s commendable what Donovan did, but the execution in script was not as strong as it could have been. The ensemble of four, including Donovan, Matt W. Cody, Mallory Hawks, and Amanda Huxtable, seemed to never stop going from character to character, costume to costume. Cody took on the role of Schindler, bringing his main plot to life via an abundance of voices and quotes. For the most part, Donovan gave himself the meatier roles, many of which including drag. Donovan has a great ability to transform from character to character. Mallory Hawks shined in the Eve Harrington track. Amanda Huxtable clearly had the least stage time but brought some of the funniest moments in her mash-up of the late Katherine Hepburn and Princess Leia. Director Regan Adair kept the fast-paced play moving. With the aid of the brilliant video design by Lianne Arnold, Adair was able to cover quick changes with ease through Arnold’s sublime video. Natalie Robin’s lights were swift and easily transformable into the billion worlds the characters journeyed through. Benjamin Klemes had a very difficult assignment as costume designer by not only having to replicate some iconic costumes but allow the actors to transform from one into another. For the most part Klemes did a fine job at iconography. Deciding what the greatest movies of all time will always be up for debate, but what is on that list is quite great. 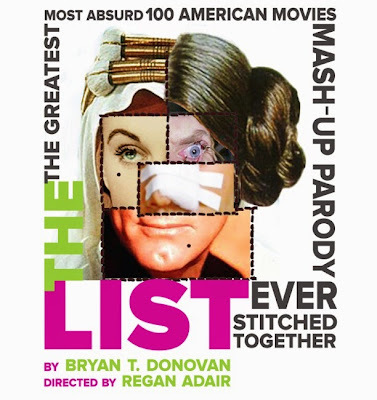 Unfortunately, the way Donovan stitched together The List may not have been as funny as it should have been. Though his passion and love for the movies shined, it just was not enough to keep the audience in stitches.